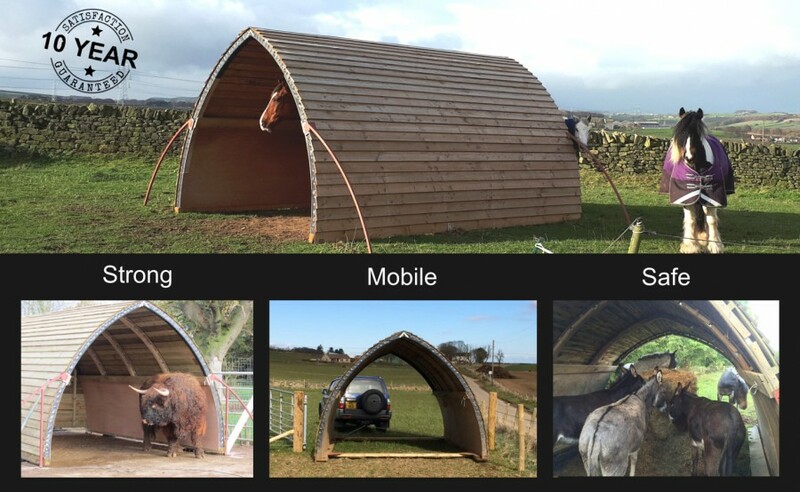 The Horse Arc is a mobile field shelter, is does not have a permanent base and planning permission is generally not required. Arcs are lighter and easier to move than traditional field shelters. We don't just term the Horse Arc as mobile to get around planning consent, it's both feasible and practical to move it. This means that you can use a single shelter and move its location when you rotate your grazing. The arc shape allows rain and snow to roll off rather than collect and saturate the surface. The aerodynamics of the arc are far better than a square structure, allowing the wind to roll over the arc rather than hit a flat surface square on. This reduces the risk of wind damage in severe weather. The Horse Arc has withstood up to 80mph winds without damage, so they are ideal for exposed areas. Your Horse Arc will be assembled by our team, taking 1-2 days depending on daylight, and built around our patented wooden arches, see about us for more details. Lengths of treated weatherboard cladding are fixed to the arches and finished with a PVC ridge strip secured to the apex. The cladding is extra thick (20mm) to give the Arcs strength and a long lifespan. Metal thrust bars are attached to the sides of the Arc to withstand the impact of horses rubbing up against it. Each thrust bar is bolted to 4 concrete blocks, which are buried to ground level, hiding them from sight. Two further blocks are fixed midway down the side wall. The arc is stood on Eco Grid blocks, which protects it from the ground, making your arc last even longer. Exterior grade plywood kickboards and top rails are then fitted inside the arc to help withstand knocks and kicks from horses. The Arcs are finished with hay net rings fitted to the inside. 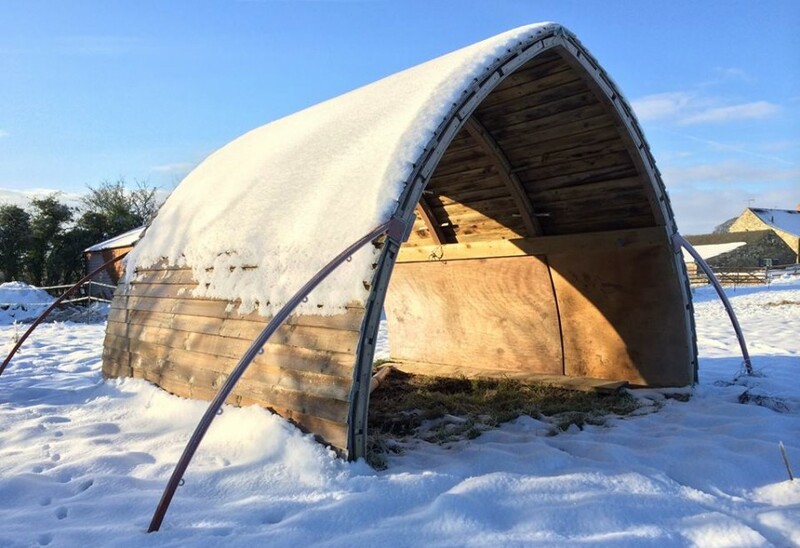 Horse Arcs have so many advantages over traditional field shelters. They are ideal for horses living out 24/7 and offer great value for money if you have multiple horses. As horses are flight animals, they are happier in spaces where they can exit quickly. Horse Arcs allow horses to relax and play in and around the Arc together. Horses who previously refused to use a field shelter have taken to a Horse Arc quite easily. The Arcs also allow fresh air to circulate and let in plenty of light. 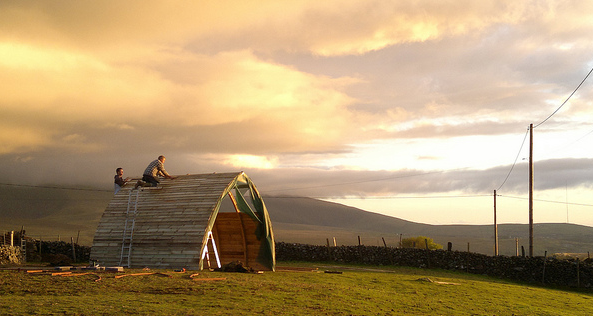 Horse Arcs provide the most elegant field shelter. The arcs sit beautifully in the British landscape, a modern and innovative structure, engineered to last but designed to impress.